First there were six, and then there were four. This is how many former Chicago Blackhawks participated in the first and then the second rounds of the 2017-18 NHL playoffs. It’s been fun to live vicariously through them and their respective teams as they progress through the postseason. We’ve now officially moved on to the Conference Finals, with only four teams left to duke it out. While 12 clubs have been defeated, two ex-Hawks remain in the running. Let’s see who’s been eliminated, and who still has a chance to raise the Stanley Cup. 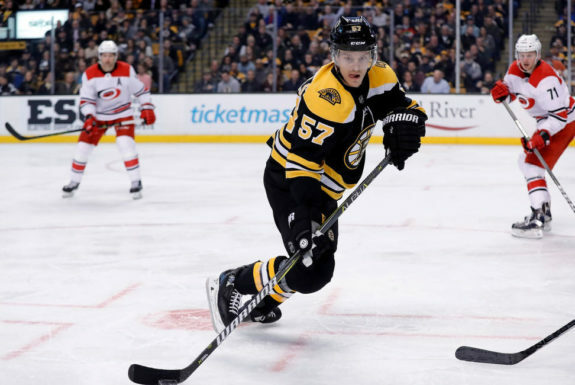 The Bruins took on Wingels at the trade deadline to complement their depth players for their postseason run. Wingels himself had the opportunity to move to a contending team. I’m sure the eight-year veteran was excited to potentially raise the Cup for the first time. Timmy (Schaller) has played well for us and so has Tommy. At the end of the day, Tommy has experience and provides some physicality. I think we’re a little short there. It’s just a gut [instinct] move to make sure we’re not too comfortable, and that we get the urgency that’s required. I think we lacked some of that up [front] at times. It certainly wasn’t both games in all 60 minutes, but I think [Wingels] can help us with that tonight. Well, it was worth a shot, but the Bruins still lost the game. Wingels didn’t play again, and Boston fell in the next two contests as well, to drop the series. As Cassidy expressed, Wingel’s role was to provide a physical element. To his credit, he recorded 14 hits and five blocked shots while averaging just under 11 minutes of ice time. Wingels did his part, but it wasn’t enough. The Bruins lost, and Wingels lost, but the Blackhawks actually won! The return on the Wingels trade was a fifth-round pick for the Hawks in the 2019 draft. It turned into a fourth-round pick when the Bruins won the first round. In the meantime, Wingels made no secret of how happy he was to play for his hometown team (he’s originally from Evanston, Il) this year in Chicago. Since things didn’t go so well in Boston, it wouldn’t be a surprise if he re-signed with the Hawks as a free agent next season. With the Blackhawks, Hartman was notorious for taking bad penalties. This carried over to the playoffs with the Predators. In Game 4 of the first round, Hartman received a penalty in the second period for roughing after getting speared by another Avalanche player. The spearing call was missed, and instead of letting it go, Hartman went after the player and got a penalty himself. In the third period, he committed an illegal hit to the head on forward Carl Soderberg. He was suspended for Game 5 and made a healthy scratch for Game 6, as well as Game 1 of the second round against the Winnipeg Jets. But with the bad comes the good. Hartman was at his best in Games 3 and 4 of the Jets’ series. In the third game, he was integral in the first goal of the contest. He took a big hit in the corner to keep the play alive, and then notched an assist on Mike Fisher’s goal. In the next contest, Hartman earned his second goal of these playoffs (his first was an empty net goal in the first round). This too was the first goal of the game, giving Nashville the lead and the momentum. 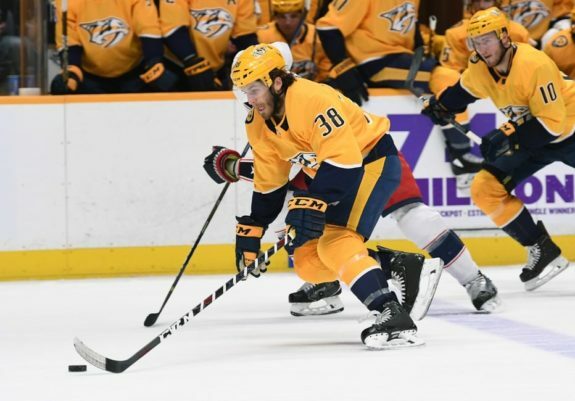 The Predators are a very deep team, and this became apparent when the fourth line scored two timely goals in as many games. But they weren’t deep enough. Nashville and Hartman fell 5-1 to the Jets in Game 7, crushing their hopes of continuing. The Washington Capitals are a pretty big story right now. Head coach Barry Trotz and superstar forward Alex Ovechkin have never made it past the second round of the playoffs. Until recently, Kempny had never even played in an NHL playoff game. But now all three of them, and the rest of the Capitals, have advanced to take on the Tampa Bay Lightning in the Eastern Conference Final. Kempny has been a steady presence as a top-four defenseman during these playoffs. In six games of the first round against the Columbus Blue Jackets, he recorded 11 shots on goal, seven hits, and nine blocked shots while averaging 19:25 minutes of ice time. In the second round, Kempny again participated in all six contests against the defending champion Pittsburgh Penguins. He averaged 18 minutes of ice time, and added 11 shots on goal, nine hits, and a whopping 17 blocked shots! 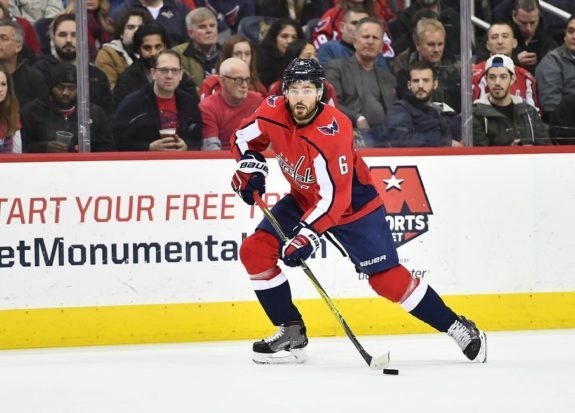 Regardless, the Capitals need Kempny to continue his efforts in this series against Tampa Bay if they want to advance to the Stanley Cup Final. Byfuglien won the Stanley Cup with the Blackhawks in 2010. Now he has a chance to do so with the Jets. He and his team have advanced to the Western Conference Final, where they will take on the newest club in the league, the Vegas Golden Knights. It’s no secret Byfuglien has been a huge force for the Jets through these first two rounds. Against the Minnesota Wild, he recorded five assists, 16 shots on goal, 25 hits, eight blocked shots, and averaged 25 minutes of ice time in five games played. The second series was a seven-game marathon, but Byfuglien was up to the challenge. The defenseman actually found the back of the net four times, including twice in Game 3. He added four assists, and continued to log the most ice time of all his teammates. Oh, and let’s not forget about 21 more hits. Through two rounds and 12 games, Byfuglien has amassed four goals, nine assists, 13 points, and 46 hits. When he was part of the playoffs with the Hawks in 2010, he tallied 11 goals, five assists, 16 points, and 99 hits in 22 games. He’s already logged more assists. I wonder if he’ll beat any more of his own records. Kempny and the Capitals are members of the Eastern Conference, while Byfuglien and the Jets reside in the Western Conference. They won’t square off against each other unless they both advance to the final round with their respective teams. This means we get to watch a former Blackhawk in every game of the Conference Finals. Can the Caps beat the Lightning? Will the Jets defeat the Golden Knights? How many ex-Hawks will move on to the Stanley Cup Final? We’ll just have to watch and see!